This low-alcohol drink mixes chamomile tea, amaro and sweet vermouth into a warm easy-sipping cocktail. 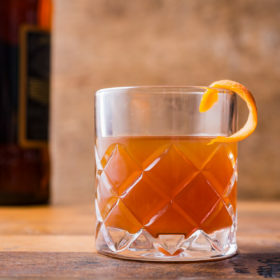 An herbal spirit like Italy’s bitter amaro is ideal as a digestif or to mix into cocktails.­ Amaro Montenegro, contained in the low-alcohol hot toddy variation here, has a nuanced, orange-tinged sweetness that balances the moderately bitter flavor profile. Amaro Nonino, Amaro CioCiaro, Meletti Amaro or Averna Amaro also work well in this drink. In footed Irish coffee mug or Collins glass, steep tea in 4 ounces hot water for 3 minutes. Remove and discard tea bag. Add amaro, vermouth and bitters. Stir, then add lemon.